Match Me If You Can - Fangirls Ahead! I didn't understand everybody's motives at all times, but I still cared more about the characters than any other romance so far. 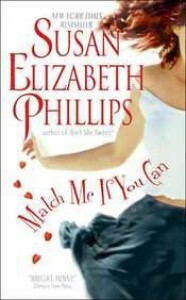 Yay for [a:Susan Elizabeth Phillips|41313|Susan Elizabeth Phillips|https://d.gr-assets.com/authors/1351268280p2/41313.jpg]!